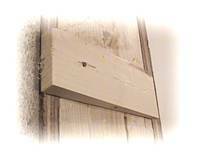 JAMBMASTER® Door frame installation jig eliminates wedging. Fast and precise door frame installation without wedging!!! The JAMBMASTER® is a new tool and efficient method for accurately installing door frames. With it you can quickly install plumb and square door frames every time with consistently high quality results. The JAMBMASTER® easily compensates for out of plumb openings and twisted trimmer studs. Door frame installation has never been so easy and accurate. Position JAMBMASTER® in rough opening. Hot glue spacer blocks onto framing. Remove JAMBMASTER® leaving trimmed blocks. Start to finish in 7 minutes. © 2003 Trig Industries. All rights reserved.